I’d like to say that I’ve grown from this experience. I think I have. I’ve learned to think about my life situation in a different light. I hope I can carry this wisdom with me as I continue in my “normal” life now. I’ve learned that I can live without so many things that I’ve deemed necessary in the past. That $5 after-work cocktail to unwind? No longer is it a necessity on a Friday. It’s a luxury. That $5 could feed a person for an entire flippin’ day. That $5 fed me for a day. I’m well aware that living on a limited budget for a week doesn’t come close to the struggles that low-income families face for weeks, months, or years on end. It does, however, give me a better understanding and a new perspective. It was also a good reminder to why I volunteered for so many years at food pantries. It was the push I needed to get back out there again; because no matter how busy life gets or how hard it may seem, there is always time to help another person out. 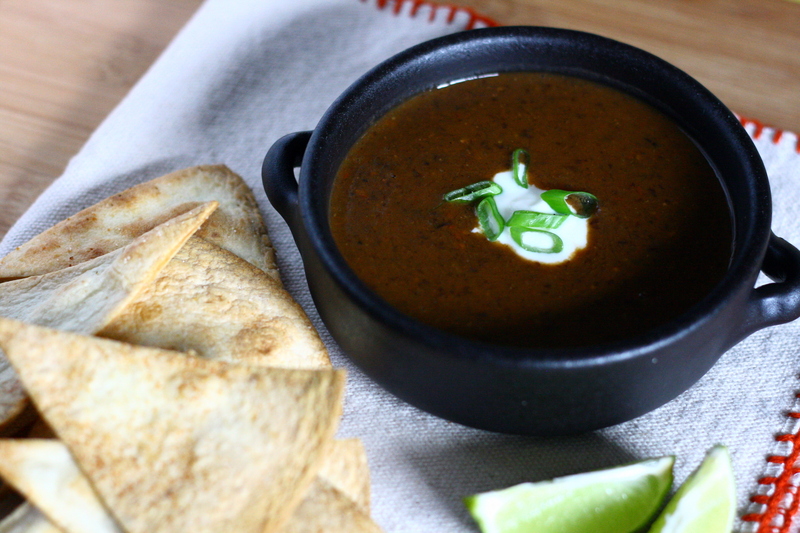 I will leave you with my favorite meal of the SNAP Challenge: spicy black bean soup with a cumin lime sour cream and baked tortilla chips. Heat olive oil in a large stock pot over medium-high heat. Add onions, carrot, jalapenos, and garlic. Saute until onions are translucent, about 3 – 5 minutes. Add spices and stir until well combined. Continue to cook for 3 minutes, stirring frequently. Add beans, tomatoes, and water and bring soup to a boil. Reduce heat to a simmer and cook until thickened, about 40 – 45 minutes. Meanwhile, prepare the sour cream: To make the sour cream, combine all ingredients in a bowl. Refrigerate until needed. When soup has thickened, use an immersion blender and blend soup until smooth or use a blender to puree in small batches. Garnish with sour cream and sliced green onions and serve with baked tortilla chips. 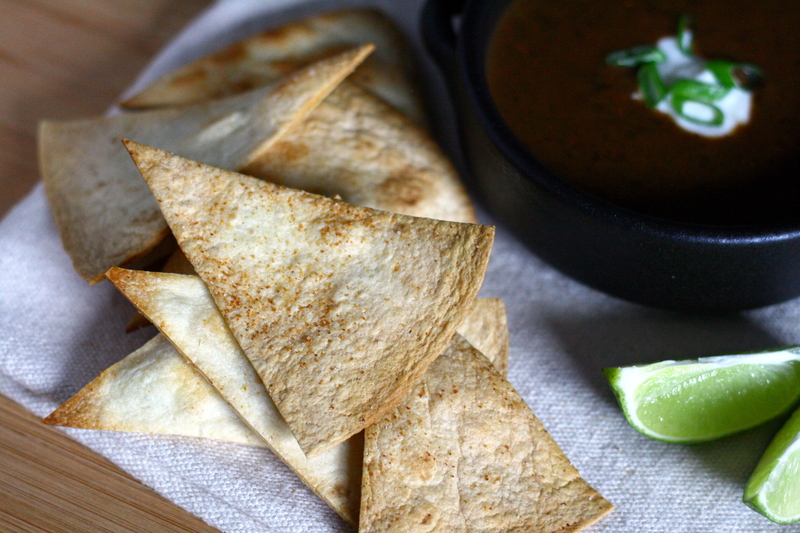 Lay tortillas in a single layer on a cutting board. Brush them lightly with oil or spray with cooking spray. Sprinkle with 1/4 teaspoon of the salt and 1/4 teaspoon of the garlic powder. Flip tortillas over and repeat. Stack tortillas and cut into 8 wedges. Arrange in a single layer on a baking sheet. Bake for 10 – 15 minutes, rotating the pan halfway through. Let cool on pan before serving. Categories: Appetizers & Snacks, Dairy Free, Gluten Free, Main Entrees, Money Matters, SNAP Challenge, Soups, Stews & Chili, Special Diets, Vegetarian & Vegan | Permalink.